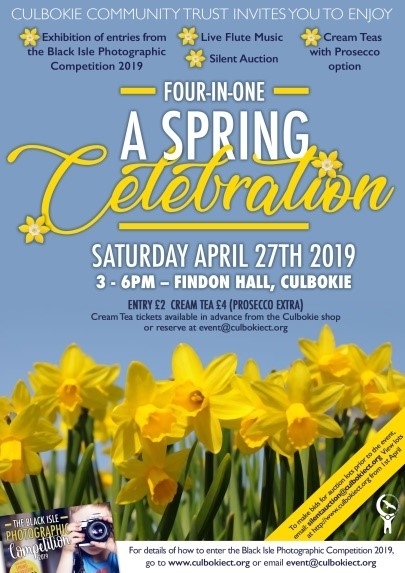 Our Spring Celebration event on Saturday April 27th at Findon Hall from 3.00 to 6.00pm offers four highlights: the display of entries to the Black Isle Photographic Competition, live flute music by Mike and Babs Crocker, a Silent Auction and a Cream Tea. Entry is £2, payable at the door, and, if you want to indulge in a delicious Cream Tea, you can buy tickets at £4 from Culbokie Spar Shop or reserve places by emailing event@culbokiect.org. The atmosphere will be enhanced by Mike and Babs Crocker who will perform flute duets in different musical styles. Whether a first-time photographer or a keen amateur, you are invited to enter 3 digital photographs into a relevant category for our first Black Isle Photographic Competition 2019. The theme of the competition is the Black Isle: its landscapes and seashores, villages, agriculture, industry, people, events and its natural history in all seasons. Sponsored by Tulloch Homes, the competition offers three categories: Child 12 or under, Teenage 13 to 17 or Adult 18 and above. Our website has links to the entry form and the rules. For our Silent Auction, several companies and individuals have been incredibly generous, offering an array of auction lots. There will be opportunity to bid on the day or online as the auction lots will be posted on the CCT website from April 1st. So step into spring with us on April 27th. All welcome!